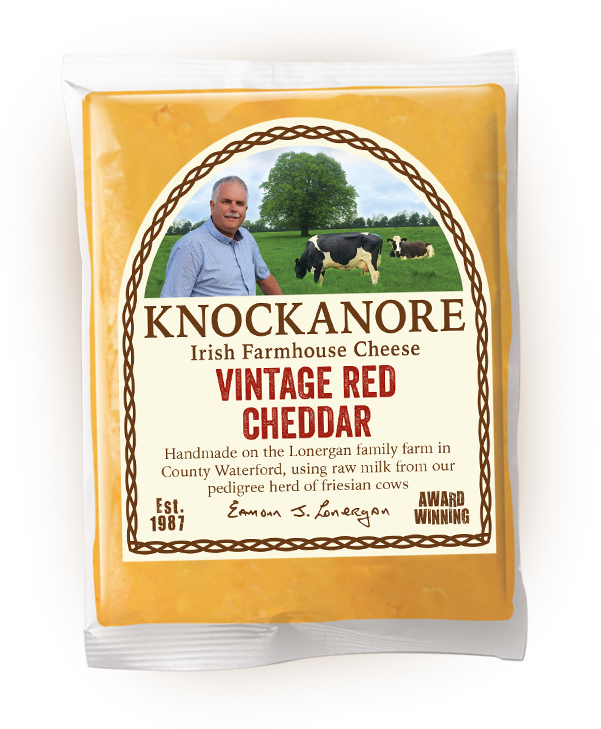 Knockanore Vintage Red Cheddar is made using raw milk on our farm in Ballyneety, Co. Waterford. All of the milk used comes from our pedigree herd of Friesian cows that graze on the lush rolling hills of the countryside. Our cheese is made using traditional cheddaring techniques which involve stacking the cheese curds on top of one another to produce a firm but slightly open textured cheese. Red cheeses take their colour from the addition of annatto, and ours is no exception. Annattois a natural seed derivative that has no flavour, nonetheless many feel that the red variety has more sweetness and depth, it could be a visual thing or it could be a fact, either way if you like the taste – eat it! 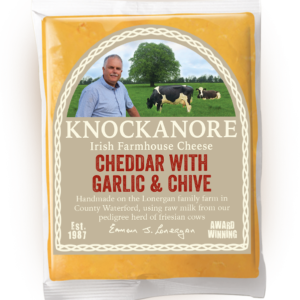 Our red cheddar is aged for nine to twelve months. 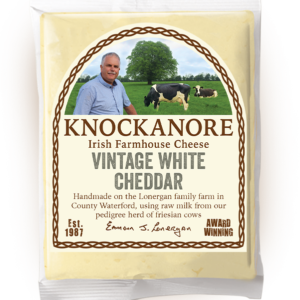 The cheese is mild in flavour with subtle, sweet and creamy tones, but with enough of a tang to satisfy real cheese lovers. Enjoy it on its own in a big chunk with some bread or crackers – it’s great on nutty brown bread with a bit of butter and some wholegrain mustard. You can also try out one of OUR RECIPES or substitute any recipe that calls for a firm cheese. We always recommend removing the cheese from the fridge a half hour or so before serving to allow the flavours to develop. Works great with lighter styles of red wine such as a juicy Tempranillo from Spain, also a zingier white like a Picpoul de Pinet or Verdejo. It works remarkably well with beers also. We recommend Dungarvan Brewing Company’s Copper Coast Red Ale.